Please refer to our stock # 3072 when inquiring. Cambodian Wooden Cow Clapper, Cowbell, ca. early 20th Century. Polychrome wood 5 1/2" H x 9 1/2 L x 3 1/2 D. It is difficult to pinpoint when exactly the use of cow bells began, but the earliest examples of truly recognizable cow bells date back to the Iron Age. A cowbell is a bell worn by freely roaming livestock, making animals easier to locate should they wander off. 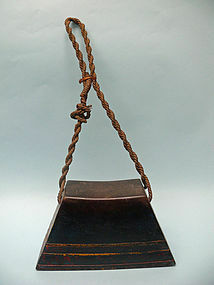 Although they are typically referred to as "cow bells", due to their extensive use with cattle, the bells are used on a wide variety of animals.